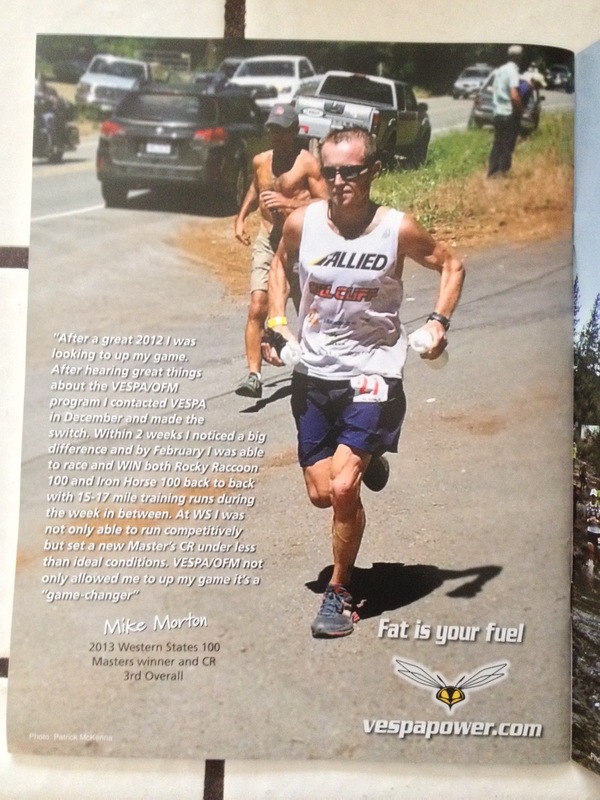 I’m sure you’ve all seen the ads in UltraRunning or TrailRunner Magazine, the one that goes “Fat is your fuel” with a pic of an outrageously fit runner powering up a trail and a testimonial about how they’re running better on less calories, or got leaner and faster since switching to a low carb or OFM (optimized fat metabolism) diet. Yes, you’ve seen it. Have you wondered about it? Here’s one from the August ’13 issue of UR: I was having a lot of gut problems this time last year- it seemed that every long training run or race involved an unscheduled pit stop, so much so that I resorted to bringing TP in a ziploc bag on these runs. I started to think, “there’s got to be a better way”. I tried Immodium before runs, I tried no fiber 24 hours before, I tried a lot of things that just didn’t work. People also noticed the mileage I was running and the fact that I still had that little belly bulge. “How can you run 2100 miles in 12 months and still carry all that fat?” one person actually said to me. After a particularly over-indulgent 2012 holiday season (I was hitting the baguettes, cake and pie pretty hard, y’all!) I said enough’s enough. I was having a cup of coffee one day at the local Peet’s and up walks my friend Eric who I hadn’t seen in about 4 months. He’s always been a big guy, so I was shocked when I saw him looking insanely svelte. Long story short; he told me that he’s lost about 80 lbs (EIGHTY!) in the last 8 months on this low carb-high fat (LCHF) diet. The Vespa ads flashed in my brain, as did the Phil Maffetone podcast I had listened to recently. It felt as if everything was coalescing into a master plan to get me to start utilizing fats as a fuel source. I was witnessing it in person that it could work. I had already started buying into the idea that my stomach problems were possibly related to wheat and gluten (seems like everybody’s hatin’ on gluten these days) so I was ready to try something. Goodbye grains. Bye-bye bread. Later, tortillas. So long, sugar. Sayonara rice and pasta. Potatoes? Aw, man- I love you but I have to say bye. I cut out all starches, processed carbs & sugars immediately. I cut out all high glycemic fruits (bananas, pineapple, mango) and stuck to berries. I started a love affair with previously under-appreciated items like full fat Greek yogurt, heavy whipping cream, butter, coconut oil, nut butters (sunflower seed & almond have become staples; all varieties of nuts for that matter). I chose grass-fed cuts of beef and free-range chicken. More buffalo. More lamb. More greens to compensate for the lack of nutrients I hadn’t been getting while on the Standard American Diet (which spells SAD, ironically! ); kale, collards, spinach, chard, lettuce varieties. Flax seeds were liberally added to meals. It took about 8 weeks of running with a heart rate monitor (something Dr. Maffetone subscribes to, more on his approach later) to keep me in that fat-burning zone. I had never run so slow or felt more awful those first few weeks; I bonked almost every single run more than 8 miles. I was so reliant on carbs for energy I had never learned to rely on my own body’s near-endless supply of fat. I eventually learned through my own trial-and-error processes and re-tweaking of the diet to add in more carbs from fruits, varieties of potatoes, smaller portions of brown rice and quinoa that it wasn’t necessarily about the quantity (although us Americans are the worst at “portion control”) but more about quality. High quality foods in reasonable portions used more effectively around my training schedule and overall lifestyle would actually support more fat burning. 1) Not only does fat become the primary aerobic energy source, but saturated fats, the most calorically dense nutritional energy source, are a key component and not the health demon they have been made out to be. 2) OFM challenges the conventional carbohydrate centric approach toward athletic performance and human health using latest in cutting edge nutritional and physiological science to help guide the on-going program. 3) OFM does NOT eliminate carbohydrates but makes “strategic” use of concentrated sources of carbohydrates. Additionally, how the athlete consumes their concentrated forms of carbs is very important to the OFM program. Through OFM, carbs are actually utilized more effectively and efficiently to yield sustainable high-level performance while minimizing oxidative stress. Stay tuned for more posts through the coming weeks. This entry was posted in Nutrition and tagged endurance sports, Low-carbohydrate diet, OFM, Optimized fat metabolism, Saturated fat, Vespa Power Products. Bookmark the permalink.